When we come near a hot body (for example the radiators of our house) we have a sensation of heat. Are we sure that is only due to conduction and convective current of air? What is our sensation if we approach a cold body? The aim of this activity is to show the relevance of the energy transmission by thermal radiation, with respect to heat conduction and convection. • N. 1 home-made radiometer (see Activity 4_1). The black radiometer faces the hot bottle at a distances of approximately 20 cm (see Fig 4_3_a). The temperature of the radiometer is registered and shown to the classroom (see Fig 4_3_b). After almost 500 seconds the radiometer is rotated by 90° with its plate facing upward (see inset of Fig 4_3_b). The temperature starts to decrease even in presence of the hot bottle. 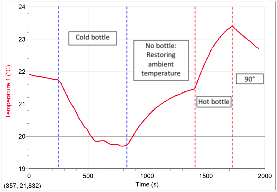 At a time of about t≈1300 s the bottle is removed and a further decrease of the radiometer temperature is observed. 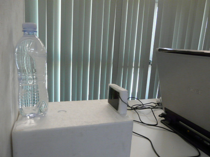 The black radiometer faces the cold bottle at a distances of approximately 20 cm (see Fig 4_3_c). The temperature of the radiometer is registered and shown to the classroom. 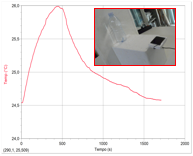 After almost 800 seconds the cold bottle is removed and the temperature of the radiometer starts to approach the ambient temperature. At the time of about t≈1400 s the hot bottle is placed in front of the radiometer, as in the previous activity, and a further increase of the radiometer temperature is measured. Finally the radiometer surface is rotated again by 90° with its plate facing upward. All the measured changes of the radiometer surface temperature with the time are shown to students (Fig 4_3d).